Examples of the “Make Me Asian” and “Make Me Indian” apps. The Google Play store has quietly dropped “Make Me Asian” and other controversial Android apps that were criticized for promoting racial stereotypes. 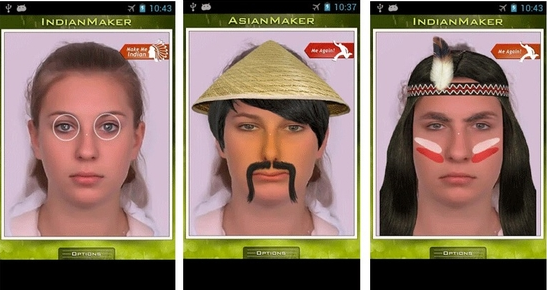 The “Make Me Asian” app, developed by KimberyDeiss, altered a person’s photo by changing the shape of the eyes and adding a Fu Manchu moustache and a “rice paddy” hat. 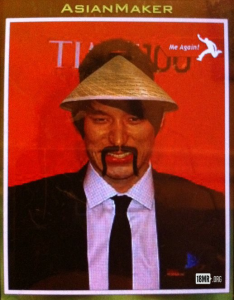 18 Million Rising used the “Make Me Asian” app on photos of actual Asians, including Jeremy Lin. 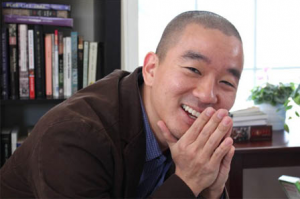 Peter Chin, a pastor in Washington, D.C., launched an online petition through Change.org and collected 8,452 signatures. More recently, 18 Million Rising, an online Asian American activist group, started a Twitter campaign with the hashtag #makemeracist. “I’m deeply thankful to the nearly 10,000 who signed this Change.org petition to take down these apps,” Chin posted. “I am also grateful for Google, who heard our outrage and pulled the apps. Chin said he did not receive any formal announcement from Google, but noticed Thursday that the apps were longer accessible. “This is not what it means to be Asian or Native American — these are nothing less than hateful and offensive stereotypes that are used to this very day to marginalize and humiliate people. They are not funny, and their use highlights a vicious double standard in the treatment of certain minority groups. “Blackface (dressing up as a caricature of a black person, complete with black makeup) is thankfully and rightfully recognized as thoroughly racist, so why in the world is ‘yellowface’ and ‘redface’ given a pass? To enlist the help of Asian American celebrities, 18 Million Rising posted photos of George Takei, Jeremy Lin, Margaret Cho, Mindy Kaling and others that had been run through the app.